USA/ Europe – Milacron will be displaying its Advanced Plastics Processing Technologies (APPT) featuring Milacron, Ferromatik and Uniloy product branded injection, PET, blow and extrusion offerings, as well as Milacron’s product brands Mold-Masters, DME, Tirad and Cimcool at K 2016 in Düsseldorf, Germany. At K 2016, Milacron, a leading industrial technology company serving the plastics processing industry, will illustrate how its new integrated approach, as well as its rich portfolio of products, provides customers with engineered solutions, the company says. Visitors to Milacron’s booths will be able to take a closer look at the future of plastics processing technology. “K 2016 provides us with the opportunity to show the world what’s new at Milacron. There are so many exciting developments happening at Milacron, our focus remains on ensuring our customers succeed. It’s been over a year and a half since we combined the industry’s leading plastics processing brands under one roof,” says Tom Goeke, CEO of Milacron. “K is a truly international trade show and it’s the ideal platform for us to showcase our innovative technologies and products, and demonstrate to customers how Milacron can help them succeed through our innovative, end-to-end service solutions.” Here’s just a sample of what visitors can expect from Milacron at K 2016. Milacron re-entered the PET machine market at NPE 2015 and will mark its European debut at K 2016. The M-PET 300, a servo-hydraulic PET system, which combines key components across Milacron’s product portfolio – machines, clamps, injection unit, end-of-arm tooling, hot runner, mould and robots – into a single solution. The M-PET series offers leading edge performance and low energy consumption plus new options for post mould handling at an attractive price-to-performance ratio, the company claims. 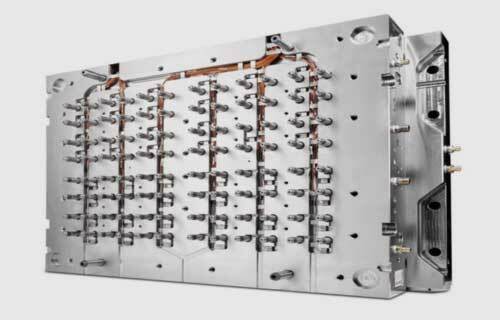 The system operates with Milacron’s Preform Tooling, as well as existing industry tooling solutions. Moreover, fresh off the first commercial sale of Milacron’s Klear Can product, the company will be showcasing all of the benefits of the disruptive innovation. Milacron’s Klear Can is a recyclable multilayer plastic can that is poised to dethrone metal food cans for the packaging of long shelf-life items such as fruits, vegetables, fish, meats, and more. Milacron recently confirmed the sale of the first Klear Can production system, with Klear Cans expected to hit grocery store shelves in Q1 2017. Manufactured in Milacron’s brand new facility in Policka, Czech Republic, the Uniloy All-Electric Shuttle machine specialises in the production of bottles, containers and technical parts from 100 ml up to 20 litres. 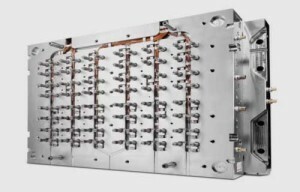 This machine represents the first model of the M-Series, 3rd generation of Uniloy’s All-Electric Shuttle blow moulding machines. Milacron both designs and builds full extrusion systems in house. Milacron’s breadth of extrusion offerings is all encompassing, from extruders, to new and rebuilt extrusion barrels and screws, to pipe heads, dies and downstream equipment, providing powerful, reliable solutions that meet customers’ unique needs. Milacron’s extrusion solutions are said to be customisable and increase productivity, output and accuracy, while reducing costs. For instance, the SV250 is a robust and flexible machine, Milacron says and adds that its practical design is able to address the needs of tube and profile processors to sheet, fibre, wire and cable. The SV250 is a stock machine and therefore available for quick delivery.